One of the most rewarding experiences for any woman is probably giving birth. Before that eventful day though, the pregnant woman does have to go through numerous physical and emotional changes. One of those changes in her body involves her legs. Since there is a tendency for the pregnant woman to retain water in that area, she has to perform these simple exercises to keep her blood circulating, and prevent unwanted leg cramps, especially at night. First, find a wall or firm surface to lean on. Then, reach one leg out behind you as you keep your heel firmly planted on the floor. Be sure to lean into the wall to increase the stretch of your calf. Hold that for 20 to 30 seconds and repeat on the other leg. With this simple leg exercise, you should start feeling more able to move about and relax to get back to your research pertaining to Oral & Maxillofacial Surgeon Jobs. You’ll get over the aches, pains and discomforts of pregnancy once you see and feel your little bundle of joy. This entry was posted in Exercise and tagged exercise for preggy, leg exercise, leg exercise for pregnant mom on September 30, 2011 by Yami. At least two coconut juice products from the Philippines are said to be selling like hotcakes in the US market. Buko juice becomes a hit because people are looking for healthier beverage choices and they veer away from carbonated drinks. This could be a good opportunity for both small and big scale businessmen to promote coconut water here and abroad. Who knows coconut juice might be another top export commodity like nata de coco that was (or still) in demand in Japan for a period of time. 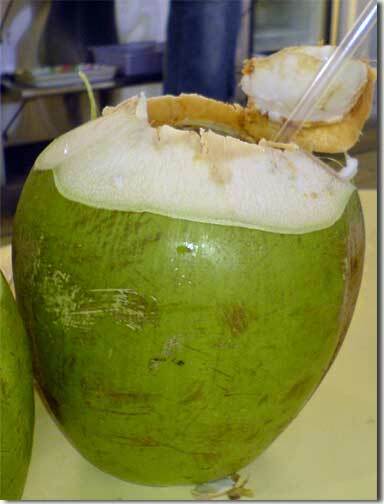 Beside its ability to quench thirst, coconut water is a healthy alternative to favorite sports drink. Coconut water contains high level of electrolytes and potassium that help with body re-hydration after a workout. This entry was posted in healthy food and tagged buco juice, coconut water, nata de coco on September 29, 2011 by Yami. My husband gave up smoking more than 10 years ago. He chose to live a healthy lifestyle than be burdened with sickness caused by smoking. What did my husband do to ride out cigarette and cigar cravings? He turns to sports. He is thankful that he has supportive friends who play the type of sport that he plays. Hubby and his friends would go out every weekend to play golf or lawn tennis. Hubby is also into biking. Apart from personal health, he quit smoking because he was concerned about our first child and our then unborn baby to suffer from second hand smoke. We would not want to raise sickly babies due to our own doing. This entry was posted in Health and tagged effect smoking body, effect smoking health, effects of smoking to health, health, personal health, quit smoking, stop smoking on September 24, 2011 by Yami.